Abstract: While nVIDIA still needs to work on improving their image quality, the NV35 aka GeForceFX 5900 Ultra has certainly brought them back into contention with ATi for the performance crown. 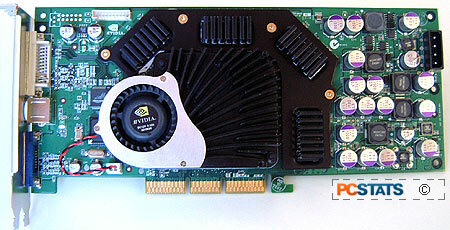 The last time nVIDIA really had an amazing videocard was when they released the GeForce4 Ti line of GPU's. At that time, most people couldn't understand why ATi didn't counter the GF4 with something better, as the Radeon 8500 GPU was not powerful enough to compete. Of course that's ancient history and as everyone knows, ATi sacrificed one product cycle so they could deliver a superior videocard next. While nVIDIA still needs to work on improving their image quality, the NV35 aka GeForceFX 5900 Ultra has certainly brought them back into contention with ATi for the performance crown. For the longest time, manufacturers used nVIDIA's reference because it saved them time with PCB layout. Why money redesigning something that is already works and is already validated? This time around though, it seems like many manufacturers are reworking the stock FX 5900 Ultra's PCB by using the FX5900 non Ultra layout! Please remember that the only difference between the FX 5900 Ultra and non Ultra is a relatively insignificant 50 MHz core speed. Because the GeForceFX 5900 Ultra is extremely complex, nVIDIA took it upon themselves to manufacture all first generation GeForceFX 5900 Ultra videocards. This is why all cards look identical aside from a few stickers. This was done as because one of nVIDIA's teir one manufacturing partners had some serious quality issues with their GeForce 4 line of videocards. When manufacturers are ready and able to take over from nVIDIA, nVIDIA will stop supplying the videocards. With that being said, the nVIDIA reference GeForceFX 5900 Ultra is built by Flextronics. 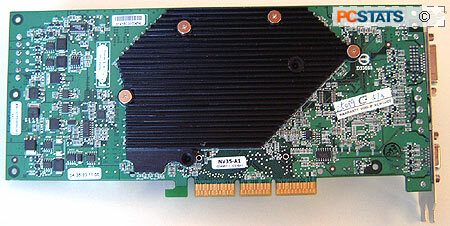 The card is backed by 256MB of Hynix 2.2ns BGA DDR memory modules. The card employs a two slot cooling solution and even with that, the card runs very toasty! nVIDIA/Flextronics is obviously not much into flashy looks as the GeForceFX 5900 Ultra is very plain. Placing it next to the Asus V9950 Ultra we see that the reference card is quite a bit longer. These days modern videocards require more power then the AGP slot can deliver that's why there is also an additional molex power connector on the videocard. It's well known that the GeForceFX 5900 Ultra produces a lot of heat; after all there are 130 million transistors in the core! nVIDIA use a two piece cooling solution on the front of the videocard, and one large aluminum heatsink on the back. Because the core will run significantly hotter than the memory, nVIDIA use one massive HSF on the GPU itself, and one large heatsink for the memory. This way you don't have the GPU heating up the memory which would be counter productive.